My husband and I have three children, and this is my 12th year of homeschooling. Our oldest child, Bethany, expects to graduate next year, and we are thrilled about that. But my job is not even close to being done. Our youngest, Hannah, is going on 6 years old (in April 2002) - and by the time she graduates, I will have homeschooled my children nonstop for 24 years. If I add to that the baby years before Bethany officially started homeschooling, that sounds like a lengthy and serious career! I've had my ups and downs in this career, and there have been some profound challenges. One of those challenges has been teaching our son, Nathan, who just turned 9. Nathan would be classified as ADHD, I have no doubt, if I were to submit him to that type of testing and diagnosis. (When he was about seven months old, our dear godly physician watched Nathan fly around the examining room, and looked at me and simply said, "Good luck!") Yet God has called us to homeschool him, as well as his sisters, and so each day I face this task anew. I often say that homeschooling Nathan is the hardest thing I have ever done. I want to say it's also the most rewarding - but there are many, many days when it is not rewarding, it is discouraging. Nathan is just now beginning to learn to read, and we are not yet on the "other side" of this struggle. Many days he and I both feel overwhelmed with tears, frustration, and the "I can't" feeling - and I often think of educator Charlotte Mason's motto for the children "I am, I can, I ought, I will." As much as I acknowledge the wisdom in her creed, I sometimes wonder ruefully how she would fare if she were Nathan's teacher! But God is faithful. He does not call us to do something without enabling and equipping us. Nathan tells me (most of the time!) he loves our homeschool, and I believe that any other school setting would be destructive to this unique and wonderful boy. I consider it a privilege to be able to be home with my three children each day, and to direct their education. And something that has been a particular blessing to us in this homeschool journey has been the AmblesideOnline curriculum plan. 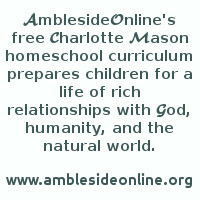 AmblesideOnline (I'll refer to it as AO from this point on) is a free curriculum plan put together by a group of international homeschooling moms who have studied the philosophy of Charlotte Mason, as well as much of the actual curriculum she taught in England a century ago. The AO curriculum plan seeks to use that framework, and as many of the key components that are easily or inexpensively available, and adds and updates other parts of it to make it a complete education for modern homeschoolers. When I first learned of the beginning of AO, I wanted to join in but felt Nathan would not be up to it. He was not on "grade level" since he could not read, and so I kept trying to use other material with him. I think I had a kind of inferiority complex where he was concerned, wanting so much to give Nathan the best, and yet feeling I could not duplicate the excellent Charlotte Mason-styled education his older sister had received. One day, though, I went to the website and looked over the booklist more carefully, I realized that we were already doing some of the books mentioned, and I decided we should try the rest of the plan, and work it out as well as we could. Nathan, as well as Bethany and Hannah, deserves the best education possible. The website for AmblesideOnline is http://www.amblesideonline.org and the website has the booklists, the weekly schedule, the information on artists, composers, and nature study, links to online books, links to the e-mail list that discusses AO, and much more. My purpose in writing this is to explain how I use the AO curriculum with my son. I am a member of the AmblesideOnline Advisory, but I am not writing this in that capacity - I am just sharing how one mother makes this curriculum work with her family. Those with very active children or children who are not caught up in their reading skills may find this helpful - but others may also find some of the ideas here profitable to consider for their families. For me, the first step each year or term with AO is to go to the website and read over the booklist for that year. I then print it out and put it in my school notebook. Then I read the weekly schedule for that year. I copy and paste the first term (or whatever term we're on) into a word processing program so that I can add my own schedule into it. Each AO weekly schedule typically states: "To this book schedule should be added daily penmanship, phonics, math, and foreign language as well as weekly nature study, art, music, and handicrafts." Therefore, those items are not listed again for each week. I decided I needed them spelled out each week (since I would be printing out this schedule when I finished with it ) so that I could add my notes next to them, and check them off when we completed them. I have also gone through and made other adjustments, if they are needed. For example, if a Shakespeare story is just listed on one week, and then not again for 2 or 3 weeks, I spread the Shakespeare out for those 3 or 4 weeks - and I write that in my schedule (Ex. : "Merchant of Venice: 1 of 3" - meaning I should read the first third of the story, and that I have 2 more weeks to cover it). After I have this in my notebook, I go back and pencil in more details - such as the Bible passages we'll try and read that week, the painting we'll do for Picture Study (during that particular week, I hadn't ordered the AO selections an AO member offers, so we were using what we had on-hand in the meantime), the musical piece we'll do for Composer Study, the focus for Nature Study, and so on. AO also has listed on its weekly schedule "Suggested additional reading as time allows." Since Nathan is not reading on his own yet, I use these book titles during our bedtime reading (except for the ones that are clearly meant to be read during history time, such as the D'Aulaire books). I'll explain more about that shortly. When Bethany was little, I had a daily lesson plan in which I wrote out in detail everything I did each and every day. I found I got discouraged because I often had to erase something we didn't get to and add it to another day - and that kept me from focusing on the things we did accomplish. Later, I only wrote down (like a journal of sorts) what we did get to that day - but that got cumbersome and if I forgot or didn't get to it for a day or so, I got frustrated with the added work it made for me. This way of writing out in general what we're to do for the week is working well for me, at last! There are items on the weekly schedule that I see as very important to get done that week to stay on track. These include the history readings, the geography book readings ("Pagoo" is the geography book for the above listed term - the other Holling C. Hollings books used by AO - "Paddle to the Sea," "Tree in the Trail," and others - are more typically geography books, but this one does explain well the geographical setting of a tidepool), the chapter book readings, and so on. Other material I consider to be "ongoing" and not as tied to a weekly schedule. That includes our Bible, our phonics study, and French. In those, we just do "what's next." This is how our week looks. Before breakfast, we usually salute the flag (I consider this very important - it's been interesting to realize how few classrooms still have the Pledge of Allegiance! ), recite our school's theme verse (Psalm 19:14 "Let the word of my mouth and the meditation of my heart be acceptable in Thy sight, O Lord, my Strength and my Redeemer.") and have a word of prayer. Here's a second part of my article, "How I Use AO." It is how I make AO work for my younger children, particularly my very active 9 year old son. The entire article is at the website below my name. Again, I hope this helps some, and that the ideas inspire others. During breakfast, we usually have two components of our Bible time. This takes place three mornings a week, since my husband Bill takes each of our children for a breakfast "date" once a week (Bethany is on Monday, Hannah is on Tuesday, and Nathan is on Friday). On the three mornings that Nathan and Hannah are not out on their dates, I do Bible with them over breakfast. Awhile back, we decided to read through the Old Testament with our younger children. I had a copy of the Shearer's "Greenleaf Guide to Old Testament History" and used their chronological reading plan. Eventually, I broke down the larger chunks of Scripture they had and put them in passages of approximately 20 verses at a time (unless the storyline required it to be longer). I didn't ask their specific questions of my children, but sometimes read them to myself ahead of time to see if there was something I wanted to be sure to note. I make an ongoing list of passage sections that are in order, that have a storyline in them that can be followed, and that are of a uniform length, if possible. I keep this list in my notebook and refer to it before each morning reading time. I also read to my children - even when they are this young - from the King James Version of the Bible. I grew up on this version, although our church alternates between using the KJV and the New King James Version. Lynn Bruce has an excellent article on why to use the King James Version in a child's education at the AO website. Sometimes I ask the children to tell me back what I've read from the Bible. Other times, though, we just work on our chart. When we began to read about the kings of the Old Testament, we got the idea from the Shearers to make a chart. Ours is not as date-detailed as theirs is, however. In fact, I don't believe I have any dates on it at all. Instead, I took a half-sheet of poster board and wrote KINGS at the top. Under that it says "Saul" with the drawing of a crown next to it (indicating, of course, that he is a king). An arrow to the side (and slightly downward) points to the name "Jonathan," indicating the name of his son (who never became king, so there are no names under him). An arrow with lines through it (we call it a broken arrow, to indicate someone who is not a son) points directly below Saul's name to the name of David, which also has a crown next to it. Saul has half of his name colored in green (for the time he followed God) and the other half of his name colored in red (for the time he went away from God). David's name is mostly all green, with a big red line in the middle for his time of sin. Right next to the names of Saul and David, we have the names of Samuel and Nathan, with a little drawing of an open Bible next to them, to indicate that they were prophets. Under David's name is a solid arrow and the name of Solomon, with a crown. The children decided to color him in green, with a red line at the end, to indicate how he turned from God at the end of his life. Below Solomon's name we have a little drawing of what sort of looks like a cloak (I am not an artist!) - that is ripped unevenly. The large part of the cloak has the number 10 by it, and the small piece has the number 2 by it. This is to indicate the story of when the cloak was ripped to indicate the divided kingdom, and how many tribes were on each side. This story made an impact on my children, so I wanted to continue the imagery. An solid arrow then goes to the left side of the chart, leading to a crown and Rehoboam's name (which my children, after hearing about him, colored all in red). Nearby is written "Judah" to indicate the name of that kingdom. A broken arrow to the right side of the chart leads to a crown and the name Jeroboam, which my children colored in green, with red at the end. Next to that is the name "Israel" to indicate the name of that kingdom. Over the weeks and months, we have simply added a broken or solid arrow, the name of the next king, and whether he followed God or not as indicated by a green or red coloring. We have also added the names of prophets where they fit in. We're coming to the end of this pretty soon - Israel already has been taken into captivity by Assyria, and we are up to the boy king Josiah in Judah. One thing that has really impressed my children as they look at this chart hung by the kitchen table each day is how, as Hannah puts it, "They're all sons on that side!" Already the groundwork is being laid for her understanding of the royal line of David, and when Nathan heard that the royal line continued through Judah, he told me that Jesus is "the lion of the tribe of Judah," having made that connection with a song he knew. They have enjoyed waiting to see how each king turns out, and already know the phrase "And so-and-so did that which was....." and they have their eyes wide open, wondering if I'll read "right" or "evil" - "in the sight of the Lord." At one point, I wanted to add some doctrinal study to our Bible time. So I got John MacArthur's new book for children, "A Faith to Grow On." I read them the main entry, and so far we have discussed together the sections on "God," "Creation, " "Sin," "Bible" and now "Jesus." Additional sections are on "Salvation," "Worship," "Prayer," "Church," "Forgiveness," "Evangelism," and "Heaven." After we complete this book, I hope to find another that goes more in depth into the Christian's walk. I have not seen Joyce Herzog's "Stepping Stones To Bigger Faith For Little People" but it sounds like something we might want to use after the MacArthur book. All of this takes a short time. Every now and then, we have added a king to our history timeline chart (more on that in my history section), but I have not done that as much as we should, since it involves more work on my part of figuring out dates and so on. But it's a good goal! Bible memory is the third component to our Bible study. Our younger children are in the AWANA program at our church, so those are the Bible verses we memorize. Sometimes I mention the verses at meal time, but in general, we do our Bible memory in the afternoons. As Nathan learns to read, we will encourage an individual Quiet Time with the Lord. For now, though, we do these things together, and we pray together at night, and whenever a need arises. After breakfast, we go to our desks for writing. Nathan still needs a lot of help in forming his letter neatly. His younger sister's writing is much neater and more controlled. He would prefer to write in capitals, which are easier to write, so I got the writing curriculum "A Reason for Writing" to have a pattern to teach him lower case letters. One of the frustrating things in teaching someone like Nathan is feeling as though you are going over the same material year after year. In fact, that is exactly what I am doing. But little by little (that is my motto with him!) things come together as he matures, as he develops more control, and as he continues to work hard at something. Charlotte Mason encouraged teaching children to make one perfect letter - and that is what we have begun to do lately. If Nathan and Hannah make a row of letters, they circle their best one. When my daughter Hannah got upset at a couple of faulty letters on her paper, her tears turned to smiles when I noted the perfect one she had made, and asked her to circle it. For a change, or when I feel they have mastered a letter, I ask them to write just one really good letter. I watched a physical change come over Nathan. In his eyes, I noted he saw a challenge, he had a slight smile, then he traced the model letter, poised over the blank spot, concentrated - and did it! OK, it had a slight up tilt, but he even noted that and tried to make just one more that was exactly perfect. This was much better than the hastily done row of letters he had done beforehand, leaving him frustrated and fatigued! I have talked to the children about starting a letter-writing day. I did this with Bethany when she was younger. Bethany got to choose who she wanted to write to - and over the years that included missionaries, grandparents, a congressman, a president, and even a popular singer. She got some letters back, and that encouraged her a great deal. It works best with my children if there is a specific day associated with a special task or activity - so I may decide Monday is the day to write letters. If I have a drawer or folder with special cards or paper and envelopes, and even stamps, that will make it more fun. (We already did this after Christmas with thank you notes.) If I take time to write along with them - get-well cards to people at church, thank you's or notes of encouragement to people - I will be an example, and I will get back into a good habit myself. As I have already mentioned, Nathan is still learning to read. It is taking a long time for him, and it has been difficult. With Bethany, I used Sing,Spell, Read, and Write, and that is what I started out using with him. This year, though, a homeschooling friend at church gave me two books from Joyce Herzog's "Scaredy Cat Reading System," and this is slowly making a difference with Nathan. Joyce's method makes sense to children, and employs the use of their imagination. Her website, http://www.joyceherzog.com, has a Message Board which Joyce answers - and I have already been blessed by her wise and godly counsel. She has a special heart for children with learning challenges, but her methods also make sense for children without them. Since we began using the "Scaredy Cat Reading System," Hannah has taken off on reading. We still have a long way to go, but I am finally encouraged, and I am grateful to God for leading me to Joyce Herzog and her reading system. I would recommend it to anyone! TIME FOR FRENCH, SONGS, AND MOVEMENT! After we spend time in writing and phonics, we do our French study. I chose French because that is what I took in junior high and high school, and I had the opportunity to visit France as a summer missionary while in Bible college many years ago. I have taught Bethany French straight through her homeschooling (she is now adding New Testament Greek, and a bit of conversational Spanish), and I even once held some Introduction to French classes in my home for other homeschooled children. I believe that foreign language study is very important - and it is certainly included in a Charlotte Mason-styled education, and in the AO recommendations. However, it is an area that is often neglected by homeschoolers who do not themselves know a language, or do not know how to communicate what they do know. I do think, though, I have come up with some ideas that are beginning to work with my younger children. There is a program called "Springboard to French" (I have seen it also in Spanish, and it may be available in other languages) which cost about $15.00 and came with two cassettes and a book. What I liked about this program was the activity level - the children were to listen to, repeat, and respond to commands, such as "stand up," "sit down," "touch the chair," "go to the door," and so on. There are other sections to the book, even one on setting the table! What I liked about this is that it makes it easy for a parent to use these phrases in every-day life. Learning how to say "Jacques and Marie go to school" is hard to incorporate conversationally, whereas "Put the napkin next to the plate" can be used at the dinner table and can be fun to play as a game with Daddy. All intro-to-language tapes and programs have some basic things in common - things like how to count, for instance. So one day a week, we play "French Ball" - we get out a large plastic ball, and bounce it back and forth to each other while saying the numbers sequentially. Another day in the week, we listen to a French tape that has a matching book - we have one that is called Berlitz, Jr. The children like to listen to the tape and see the adventures of "Teddy Berlitz" - this also reinforces basic vocabulary, word order, and some conversation. AO mentions Lyric Language - and this is a cassette/video which has songs sung in English and in French. This is a nice addition to our material, and can be a fun way for some children to learn, but it is really supplemental. I also have a few children's storybooks in French - such as Good Night Moon. Since I know French, I can read this to the children. A parent who is learning along with their children could ask a French-speaking friend to record the book on tape so they could listen along as they read it. My idea is to plan a day per week for each of these ideas. But if I had just one recommendation of what to start with, I'd say the Springboard program, since a person could incorporate acting out (role-playing) as well as "French Ball" with it, and also use it in every-day-life settings. If we have a late start in our day, I skip French and our songtime. Even in a rough week, we still get it in a couple of times. It makes a nice break, though, if we can include our songtime. Our songtime begins with a kindergarten-style memory song. We have one for each day - and we march around or sing in a circle, just to give them a time to be wild with permission! This is when we sing songs about the months of the year or the books of the Bible. Then we sing a patriotic song and a hymn. The AO curriculum has a list of folksongs and hymns for families to include in each term, and they are excellent (and can be found on the AO website). Because I already had a plan for what I was going to do before those were listed, I have gone ahead and used my own selections. Since the events of September 11th in the United States, I chose patriotic songs to teach my children. (Before that, I was teaching them some basic 'songs of the culture,' like "I've been workin' on the railroad," or "The Erie Canal." I will return to those at some point.) There is a children's tape called "America's Favorite Patriotic Songs for Kids" that has been helpful in this. I have also tried to teach them the songs for the branches of the military. They especially enjoy these, since they can march to them. The entire time allotted to writing, phonics, French, and songtime - if we do it all - is about an hour to an hour and fifteen minutes. I know Charlotte Mason advocated short lessons - but we do it this way because it works best for Nathan also. We take a break at this point - usually at 10:00 a.m. - and the children help me get a snack ready. Usually it's microwave popcorn and juiceboxes, placed on little trays I got at the craft store that they painted for this use. It is not that my children are so hungry (even though they will say they are! ), but I find that if they have a snack it helps them to stay quiet while I read to them! So that was the original motivation of our snacktime. When we settle down for our next chunk of time together, I start with poetry. I read them one poem each day, usually from the poet listed for that term by AO. Occasionally I will digress from that, reading a poem that suits the season or a special day, but in general I really like the idea of their getting to know a poet and his or her work. I gather the poems from anthologies I own, books of that poet I have, or works of that poet I have printed off the internet from poetry sites (I often put those together in my own "book" by comb-binding them). On occasion, I have asked them to draw the poem - or to tell me what it's about. But usually we just enjoy them. Then it's time for our history books. The AO plan for Years 1-3 currently includes two different history books: Hillyer's "Child's History of the World" (often referred to on the support group e-mail list as CHOW) for world history, and Marshall's "This Country Of Ours" (referred to as TCOO) for U.S. history. I have found that having two different history books going at once is not that much of a problem. What I do for both selections is I divide up the reading over one week, into 4 or 5 equal portions (or portions broken up by obvious storyline breaks). These are all read-alouds for us. Nathan is to narrate back to me what I have just read him. I often copy down what he says (since it is rarely very long!) and I record it in a little composition book. Sometimes I read his writing back to him ("The War at Sea, by Nathan Breckenridge", I tell him) and he enjoys hearing it. We use other means of narration, too, besides "tell me the story of what I just told you." Sometimes he is to ask me questions on what I just read. This is often fun for him, because he doesn't realize it is as much work for him to come up with questions as it is for me to come up with answers! Those questions reflect an understanding or connection with the material. Sometimes he acts out the material, enlisting the aid of Hannah or me as he does so. Sometimes he draws what I've read him, and then I ask him to tell me what's in his picture. And occasionally he will show me with his Lego or Playmobil guys, or even draw it on Paintbrush on the computer. I have not yet had him record his narrations into a tape player, but I am going to try that, too. "Child's History of the World" is usually not a problem to understand. I did substitute the first few chapters (which are on the Big Bang and evolution) with some other creation books; however, I spent some time explaining what evolution was so that my son was familiar with it. He now is very quick to tell me when he sees or hears evolution being taught. But "This Country Of Ours" is a much more challenging book. Some people have skipped it all together, but we have stayed with it. There have been times when we needed to make adjustments, though. I have on occasion read something else on that week's topic - like something from Tim Crater's book "In God We Trust" - but usually I just add that to the week's reading, if it's pertinent. Sometimes I have skipped a section within a TCOO chapter (this is not strictly "CM" I know, so understand this is just my opinion) - and gotten to the 'storyline' part. (Another example - we're right now in the chapter "War at Sea." The "meat" of the story is John Paul Jones and the story of his adventures - and some of the beginning part of the chapter seemed to be extraneous or hard for Nathan to follow. So I read it but didn't ask him to narrate any of it, and got to the Jones part, which he was to narrate). I have also done something else at times - I introduce the chapter to my son. I'll say something like "This next chapter is about how the Colonists did such-and such - and they're going to have a special leader I want you to listen for and see what he does." Then I read it verbatim. I think a child can get so lost trying to figure out what's going on that he isn't able to listen to the material. This has helped my son a lot, I think. TCOO is a great book - but it can be hard for younger readers, especially in totally unfamiliar areas of history (as opposed to stories about Columbus, Pocahontas, the Pilgrims, or the Colonists, which a lot of children already know something about). I still think it's worth it, but that a parent may have to make minor adjustments. One other thing we do that is helpful - we have a wall map of the United States (I think we got it as a poster from God's World). I have had Nathan make little (very little!) drawings of a Redcoat, a Minuteman, etc. - and we cut them out and we put blue tack on the back of them, and put them on the map where the story is taking place that week, or where the characters move around to (this has been especially helpful when reading parts about battles). This has given him an action to go along with the book, and has added to his knowledge of geography. There is one final thing we do for history. Charlotte Mason wrote about a Century Book, or a kind of Timeline Book. Bethany had one during her grammar school years, and then asked for a new one for her upper grades (she wanted something that didn't have her child-like drawings in it!). But since she was reading and writing at a younger age, that worked for her. I wanted to be able to teach the concept of assocations in history - but I wasn't sure how to do this with Nathan. Then I hit upon the idea of a once-a-week timeline chart. I got a roll of some butcher paper (newsprint I guess is a better term!) and made basic divisions of time. On Fridays, we unroll it all across the floor (it's very long!) and use markers to add some representative drawing or symbol from what we read that week in CHOW or TCOO. I wish we had done this from the beginning - our early centuries are rather blank! - but it has helped already in letting my younger children see the span of history, and even how the events of the Bible fit into that. After history, we read the literature selection for the day. "Pilgrim's Progress" is listed for years 2 and 3 - so we read a portion of "Pilgrim's Progress" on Monday. The schedule calls for "about 800 words each week." I have never counted this out, I just read a portion until it seems to make sense to stop. It appears we will finish this book on schedule. (Nathan has asked me to continue reading the second part of "Pilgrim's Progress" when we finish.) On occasion, there have been some lengthy passages in "Pilgrim's Progress" which list verses and explanation of those verses, and I have sometimes skipped over a few parts. In general, though, Nathan has been able to follow the storyline. He was familiar with the book because I had read him the illustrated children's book "Dangerous Journey," and because he has seen a video on the story. Not too long ago, we began to chart out the journey of Christian on another piece of butcher paper/newsprint. This became a kind of drawn narration that Nathan did as I read him the story. But his ability to comprehend the challenging literary language of the unabridged "Pilgrim's Progress" reminds me why I love the AO curriculum. The fact that my son is not reading yet does not mean he should be 'fed' what Charlotte Mason called "twaddle" - dumbed down material that does not nourish his mind and soul. He looks forward to hearing this very book each week, despite (or because of?) how intellectually challenging it is! On Tuesdays, we read the geography book that AO recommends. For the most part, these have been the Holling C. Hollings books. When Bethany was little, I bought the Beautiful Feet maps, and so I have pulled them out to help Nathan visualize the books. I think for the next book I will have a small drawn character of some sort to tape to the map so we can follow along with the text. There was one term when no geography book was listed, so I replaced it with a book I found - an out-of-print book about Antarctica written by Admiral Robert E. Peary, called "Snowland Folk." The idea is to read something well-written that focuses on one particular area of the world. We also use a globe when we are reading geography books, for reinforcement. On Wednesdays, we read the selection from "Beautiful Stories from Shakespeare." Years 1-3 use these children's versions of Shakepearean plays. I do not have the book, so I go to http://www.worldwideschool.org and click on library. Under "Literature" I click on "Shakespeare" and then "Beautiful Stories from Shakespeare." On the left side, I click on whatever play-story I need, and then I print it out. I divide the story up over the weeks I will be reading it. (Earlier on I read an entire story in one day, and it was not sinking in at all.) One of the moms on the AO list (and a friend of mine), Vanessa, shared an idea that works well with us. We get a sheet of posterboard and write the play's title across the top. Then we draw stick figures to narrate the story each week. Sometimes I draw the characters as I read the story, if it is especially confusing to follow (similar to the stick-figure note-taking Edith Schaeffer describes in her book "Hidden Art"). The children have done very well remembering and narrating the plays when they have drawn the narrations this way. Familiarity with Shakespeare's stories will make reading the more involved stories by Charles and Mary Lamb ("Tales from Shakespeare") in Years 4-6 easier. It will especially be an aid when the children finally read the plays themselves in the upper years. So many students get lost in trying to figure out the story line that they cannot come to appreciate the language of Shakespeare. On Wednesdays, we also add another activity - music theory. (If there is not time for this during this lesson time, we do this over our lunch break.) When Bethany was little, I got a program from Elijah Company called "Keyboard Capers." It is a book that gives sequential games in order to teach music theory. We do one short game a week. Eventually, I hope to teach Nathan and Hannah the piano by using the Madonna Woods' program that I used with Bethany. On Thursdays, we read whatever is the "chapter book" assigned in the weekly schedule. Right now we are finishing "Wind in the Willows." On Thursdays we also add a short health study. I use colorful books like Dorling Kindersley's "My First Body Book," and do one topic a week. I have also read short children's books (usually illustrated books) that introduce topics like adoption, pro-life issues, and fire safety. On Fridays, we have read sections of chapters from Nathaniel Hawthorne's "Tanglewood Tales." Nathan has enjoyed these very much, and at times they have prompted good discussions about mythology. (Wendi Capehart has an excellent article on the use of fairy tales and mythology in a Christian education - it is located here on the AO website.) On Fridays we also take some time to read the current issue of the weekly "God's World" children's newspapers. This time when I read poetry, history, literature, and sometimes health or current events takes about an hour and fifteen minutes. It is the richest part of our day, though - and the time we look forward to the most. On good weather days, if we finish on time, we take a short bike ride together at this point, and fifteen minutes later, the younger kids sit down to watch my wonderful Teacher's Assistant - Mister Fred Rogers! That's when Bethany and I sit down to do some of our work together. When their program is over, they are to play (quietly!) until lunch time. Over the years we have done some Charlotte Mason-styled studies together as a family over lunch. My husband is able to come home for lunch most days, so this has worked out well for us, and we have continued to do it that way. On Mondays, we have Nature Study at lunch. Sometimes I read some material first as we eat (such as from Anna Botsford Comstock's "Handbook of Nature Study"), and then we go for our Nature Walk, looking for things we have read about. Other times we pack a lunch and go for a walk in the woods. Some days we bring things back to draw, other times we draw something from nature that we see while we are on our walk. We bring along our Field Guides with us, or we look things up when we return home. AO has recommendations for a Nature Study focus per term. I have often used that recommendation, or adjusted it based on the time of year and the likelihood of seeing that plant or animal or bird. But no matter how hard I try, winter still remains a difficult time for nature study. Some good winter nature study for us has been a focus on birds, a focus on tracks (especially in the snow), a focus on stars (I'm planning a night when we take the children to a spot to see the stars they have studied), a focus on weather, and a focus on using a magnifying glass, binoculars, and how to use a compass. Often we study something like mammals, for instance, and then go for our nature walk not necessarily looking for that particular thing. Other times I encouraged them to go on a 'sound nature walk,' listening for any sounds of nature, or a 'signs of spring' nature walk, or a focus on 'what stays green in winter.' We have also participated in the Audubon Society's annual Backyard Bird Watch, in which you write down (and submit a list online) every different bird you see in fifteen minutes, and how many at a time of that bird. When Bethany was young, she had her own Nature Notebook. I tried that with Nathan and Hannah, but I am doing something a little different since January. I have made a large Breckenridge Family Nature Year Notebook. Each family member can add something to this notebook each week - either a drawing or a written or oral narration of what is happening on that date nature-wise in our yard, our street, or a place we are visiting. We will even include any charts on what begins to grow and when, what leaves turn what color and when, and so on. My plan is to do this for an entire year. Each entry is placed in a sheet protector and put in the notebook. It is important to me that my children recognize the hand of God in creation, especially, so I will be adding pertinent verses throughout the notebook, too. After this year is over, we will probably return to having them each have their own nature notebook. On Tuesdays, we have Picture Study. We have done this ever since Bethany was 6 years old. At that time, we used Cornerstone Curriculum's Adventures in Art and their art prints. After we went through their three galleries of prints, we used art books (if it was an old book in bad shape, we cut out the prints, put them in sheet protectors, and began a notebook with that artist's work). More recently, we have ordered the fine prints that an AO member, Angela, offers to make (information for this is on the AO website). AO suggests a print every two weeks, but we have always done a new print each week, so we often add prints or artists to their list. Although some have read about more involved art study lessons some families use, we have always done this very simply. I show the new print to every person around the table, they look at it for a time, and then I remove it when they are done. Then each person tells aloud what they recall about the painting. We then discuss it a little bit - if I have information on the artist or his life, I share that. Then we hang it on the wall by the table (with the artist's name and years posted next to it) where it remains for a week. I also try, when possible, to show with a tape measure how large or small the actual painting is. When every print is the same size, a child (or adult!) can begin to think the actual work is the same way. We have been able to visit some art museums and see the paintings we have studied. We have been to the National Gallery of Art in Washington, D.C. ("Look, Mommy, there's Monet's BRIDGE!") and the Art Institute of Chicago, and we hope to go to the Metropolitan Museum of Art in New York soon. Sometimes on Thursdays I have some kind of craft or art time (this takes some planning ahead, so it is an area I have to work on). I also let Nathan cook breakfast on Thursday mornings (someday his wife will love me! ), and I will do a bit more cooking with Hannah that day, too. On Fridays at lunch, we have Composer Study. I have not been as successful recently with Composer Study as I have been with Picture Study, but I continue to persevere! Collecting the suggested works is the hardest job. Lately, I have found that having the works on a CD is much better than on cassette. I have had mornings run late and then gone to play the work-of-the- week, only to be very frustrated at how to find the piece I want halfway into a cassette, especially if it is unfamiliar to me. With a CD, I can just punch in the number of that work and it will play. I often read something aloud to my family about the composer first before playing the music. I have "The Gift of Music" by Jane Stuart Smith and Betty Carlson, and that book is extremely helpful. I also got a copy (first from the library, then from a used book site) of "Famous Composers for Young People" by Gladys Burch and John Wolcott. Each chapter in this book starts with a picture of the composer, which I photocopy and put up on the wall by his name. After reading something about the composer, we listen to something of his work. That part is not a problem - but I have found that it is insufficient to play something once and expect to have any real familiarity with it. It is true that my children have picked up on the style of a composer, since we study several works over several weeks. But I am trying now to play that piece often during the week so that they become more accustomed to it. Each afternoon we have another short lesson time. Scheduling is important in a Charlotte Mason-styled education, and I found that having math right after writing and phonics in the morning (which I used to do) was an overload on Nathan. His mind seems fresher and more able to focus when he has had a break of "Mister Rogers," a short play time, and our lunch study before going on to math. When Bethany was young, I used Mortensen Math with her. I appreciated the use of manipulatives and much of the way the program worked, but I became very frustrated with my inability to order more material. Saxon Math looked mind-numbing to me, and I vowed I would never have a child of mine use it! I am sure it works for some families (although to fit it into a CM-styled education, a family would have to reduce the number of problems the child is required to do), but I cannot ask a child to do something I know I would hate. Then I found Math-U-See - which seems to me to be a wonderful blend of the manipulatives and hands-on approach of Mortensen and the orderly progression of Saxon. Bethany now uses it and will complete all they offer, and Nathan and Hannah have begun it. I went through the Introductions level with my younger two - letting Hannah at that time work along with us, but really focusing on Nathan's understanding of the material. Math-U-See requires total mastery of each lesson before moving forward - except at the Introductions level. With Nathan, however, I stayed long in Introductions, since he was older, and he really understood each part. As a result, now that we have begun the Foundations level, he is familiar with what we are doing, and beginning to achieve mastery of the material. That is a real boost for him. We keep our lessons short - and right now have a typical pace of a new lesson every two weeks. The AO curriculum has a list of extra books to read, and I myself found some books I wanted to read to the children, or that they wanted me to read to them. I really didn't know where to fit them in, until I began an afternoon teatime. I do not do this every day. But most afternoons at our house, at 4:00, the children and I (and these days, a neighborhood friend joins us) sit down for hot chocolate and a snack (in china cups!) - and a reading time. (We often do this through the summer, too, and have it outside.) I have read them missionary stories and biographies at this time (we spent a very long time reading Russell Hitt's "Jungle Pilot, " an adult biography about the life of missionary martyr Nate Saint - Nathan absolutely loved this story). Right now, though, we are going through the American Adventure series of books. We are up to number 6, "Danger in the Harbor." I also read some of the American Girl books at teatime. We're reading "Meet Kit," the girl from the Depression era, right now. (They hear missionary stories during our church's Mission Kids program on Thursday nights (children's prayer meeting), which I lead.) Our teatime lasts about 20-25 minutes. But about three or four nights a week, we read aloud from 4 different books or types of books. I find my children have learned to keep them all straight in their minds, and to enjoy a variety of book styles this way. First we read a Sugar Creek Gang mystery, which Nathan has checked out from our church's wonderful Children's Library (run with love and expertise by a retired schoolteacher in our church). Then we read one of the books on AO's suggested reading list. Right now we are reading "Black Beauty." Then we read a biography from the Childhood of Famous Americans. We are on Thomas A. Edison now, with a promise to Hannah that we will read Sacajewea (her favorite historical figure!) next. Then we read from one of Thornton W. Burgess' animal stories. On Saturday nights, we add a children's Bible story book, in anticipation of the Lord's Day. I have wanted to spend some time teaching Hannah some 'feminine arts' - but really didn't want to include Nathan in this. I came up with the idea of using a short time Sunday afternoon for this. So this past week, Hannah and I sat down with her doll's tea cups set up (her idea!) and I began to teach her to cross-stitch. Nathan and my husband had a special Father-and-Son time then - I'm leaving it up to my husband as to what to teach him during this time, but I know an excited Nathan came in for his pocketknife at one point, and they also put together a bookshelf I had bought. I have heard happy snatches of conversation as Nathan ran by on his way to "get something for Dad," so I know this time is very special to him. I know Bill is also using Nathan's interest in army stories to try and teach him some body-control. It seems funny to teach him to stand at attention, or to march properly, but for a boy who is constantly moving, such body-control skills are very hard - and may help him gradually learn to handle himself better. The AO curriculum lists three weeks per year as Exam Weeks. This can be very daunting to attempt the first time, both for mother and child/student, and I was uncertain as to how it would go with Nathan. Our first time with exams was so horrible, I don't think I saved a single note from it. I was discouraged, he knew I was upset and he was upset, and I felt like a complete failure. Later I reflected on how I was doing things in our school, and I made several adjustments (some of which I have just written about) in how we do things. Our next exam week went somewhat better. I hope to add our exam results to our website in the future. It was still a struggle, though, and I skipped exams another term (which went over the summer when we had a break). I expect to have exams again when we complete this term 3 of Year 2 in a couple of weeks. The idea of exams is to take a week off from regular lessons and use the time to ask the child to narrate material that was covered in that term. One common mistake is to want to go over the material in too much detail, or to think of it in terms of regular tests. The idea here is to discover what the child remembers. As I said, I hope to include a sample exam week on our website. In the meantime, though, here are a few ideas of what kinds of questions I asked during exam week when Nathan was 7 1/2, and we were doing Year 1. "Write down the Alphabet in order." "Can you tell me what you remember about 'St. George and the Dragon'?" "Can you sing 'All Creatures of our God and King'?" "Can you sing 'She'll be comin' round the mountain'?" "Can you tell me the poem about the 'white hen'?" "Can you tell me the poem about 'who has seen the wind?' "
"Can you tell me about one of our Picture Study pictures by Caravaggio, or draw me what one of them looked like?" "Can you tell me what you remember about "Tree in the Trail"?" "What can you tell me about King David, and the temple, and who was king after him?" "Can you tell me what you know about Captain John Smith and Jamestown?" "Can you tell me anything you know in French?" "Can you count in French?" "Can you tell me about Decimal Street?" "Can you count by 2's?" "What do you remember from "Body Battles" (our health book)?" "Which one of Aesop's Fables did you like, and what happened in it?" "What was your favorite story from the James Herriott book?" "Let's see if you can tell me some of your Bible memory verses." "Do you remember anything about Homer, and the battle at Troy?" "What can you tell me about The Tempest?" "Tell me what you remember about 'The Velveteen Rabbit.' "
"Can you tell me anything about 'King of the Golden River'?" "Do you remember any of the Parables from Nature?" "Can you tell me about Vivaldi?" This took place over an entire week, with no other schoolwork taking place. I plan on making our next exam week very special, perhaps with us going out for lunch, or some other way of making it clear this is something to look forward to! Next year, Hannah will begin Year 1 in the AmblesideOnline curriculum, when Nathan is partway through Year 3, and getting ready to start Year 4 (and Bethany is in her last year of school at home with us). Hannah has heard some of the material already, but she was much younger then, and I want her to have her chance to narrate and make relationships with the material. I don't know how that will work out for me - or when Nathan's reading ability (or hers) will catch up to the material. But I have a true partner in this educational journey. My husband stands with me in this - and for that I am very, very grateful (he is not only Principal of our school, he is its chief Prayer Warrior) - but I am not referring to him. God Himself leads, guides, and strengthens me in this. Charlotte Mason wrote in her book "Parents and Children" (Volume 2, p. 48), "All our teaching of children should be given reverently, with the humble sense that we are invited in this matter to co-operate with the Holy Spirit; but it should be given dutifully and diligently, with the awful sense that our co-operation would appear to be made a condition of the Divine action; that the Saviour of the world pleads with us to 'Suffer the little children to come unto Me,' as if we had the power to hinder, as we know that we have." It is an awesome responsibility to teach the children God has given me. My goal is to be as Charlotte Mason described ("Home Education," Volume 1, p. 352), "having patience until they ["the vital truths which the Christian mother will present to her child"] blossom and bear, and his soul is as a very fruitful garden which the Lord has blessed. But, once more, 'This kind cometh forth only by prayer.' "
On the Charlotte Mason list, I am to lead a discussion on making the CM approach work in your daily schedule. So as I wrote the post, I decided to be specific enough that I can post it here, in response to a question about combining years and having to read aloud to more than one child. I need to let you know upfront that I don't see myself as an expert (and I am writing this as my own way of doing it, not as an Advisory member) - just someone who's been on the journey a very long time, and maybe knows where a few of the pitfalls are, and how to avoid them. Then again, homeschooling is so unlike any other teaching or educational endeavor. Our 'classroom' changes on a yearly basis (no "this is my 9th year of teaching 3rd grade" for us! ), and we must constantly re-create how we will do things to adjust to our growing-up (and sometimes just plain 'growing'!) family. One of the Charlotte Mason distinctives I have noted over the years is how we 'group' our subjects. Yes, short lessons are a hallmark, but even short lessons that don't take into account the way the mind works can be self-defeating. Here's an example. Have you ever sat for an extended period of time, trying to balance a checkbook, or work out the expenses of a grocery list or calculate how to figure your budget for the week? After a long time at this, you can start to make little mistakes, mistakes that are not typical for you. Your mind has just gotten tired. Or you spend time writing thank you notes or Christmas cards or some other extended writing and your script turns very sloppy and becomes nearly illegible? When we use one part of the brain, we need to give it a 'rest' by switching to another form of mental work. History or literature involves the use of our imagination, an entirely different mental process than what we need to do something like math, or writing. The homeschooling mother who realizes this will not only seek to stick to short lessons; she will work on the grouping of her lessons, the scheduling of her younger children's day, so that the children stay 'fresh' in their work. Food analogies are so popular in CM's writing that perhaps I can use one here. As mothers we want our children to eat the best food, the food that provides the most nourishment possible. (Well, we try anyway! ;-) But we also work on the 'menu' - the actual arrangement of that food in the best possible 'groupings.' We don't give all the vegetables on Monday, all the fruit on Tuesday, all the cheese and yogurt on Wednesday, all the meat and fish on Thursday, all the candy or special treats on Friday (unless, of course, we're feeding a food-jag toddler, which is an entirely different matter!). I think of scheduling as kind of like the menu. Most of us have learned, or are discovering, the best 'food' to give our children in terms of books and material; it's the 'menu' that we sometimes need help with! Schedules of how Charlotte Mason ran her schools during a certain point in time are listed in the back of both of Catherine Levison's books, "A Charlotte Mason Education," and "More Charlotte Mason Education." Catherine also includes examples of her own family schedule. I can't improve on either of those things. I will, however, share my own schedule - not as a model or even a pattern, but as an example of how one mom is trying to put her homeschooling together, and as a springboard from which you can jump off ideas and plans for yourself and your own homeschool. Right now, I have a 17 yod at the end of her junior year (she has always been homeschooled, and always in my understanding of a CM philosophy of education), a 10 yos who is age-wise in 4th grade but who is behind in some areas and would be getting special help were he in a formal school; and a 6 1/2 yod who is in first grade. This is the first year that all three of them are in school that 'matters', if you know what I'm saying. Education goes on all the time, and what my youngest was learning before first grade is so very important - but in terms of 'school,' this is the first year they've all been 'enrolled' at home. It's been a challenge, but then each year brings its own challenges and struggles and opportunities! My ds is not reading fully yet - he is improving daily and we thank God for that, but he is not at a level of fluency in which he could read any meaningful material on his own. His understanding and narrating ability is usually very good, though, so we did not want to hold him back. He is partway through year 3. My youngest dd is in year 1 of AO, and she does read quite nicely. However, year 1 is not the equivalent of a typical first grade curriculum, and it is not designed (or in any way required) for these students to be able to read this material on their own. Therefore, I do need to read aloud all the books. That presents a time challenge and a scheduling challenge, and I want to share how I am working it out. I know some moms are in similar situations and perhaps can glean from this. Still other moms will have other solutions and I invite you to share them as well. The main way I do this is through what I call "Alone Time" and "Together Time." (Catchy, huh??) I knew that because of my son's needs for special attention in reading, there was no way I could combine their learning of handwriting, spelling, phonics, and other language arts. So I created "Alone Time." Each morning, each of my younger children has a half hour alone with me at the kitchen table. (In summer, this is the only 'school' I do. I admire all of you who school all summer - but I find I need that break! Alone Time, though, provides a structure to their summer mornings and continuity in this one part of their studies. In summer, I am more creative in making this time really special - setting out my china and making it more like a teatime with mom than schooltime!) The other child gets to go on the computer. For awhile, I had them do some minor seatwork during this time, but since they alternate 'who goes first', I was getting bogged down with assigning specific work. I expect I will go back to some required seatwork as they gain more understanding and can handle more independent work (copywork, etc.). After Alone Time, I have a Together Time with them in which I read aloud the material from AmblesideOnline. They are not on the same year, but rather than separate them for this, they each listen in on the other's readings. They narrate their 'own' material, and I have them do that into a little Playskool tape recorder! I keep the narration tapes and that is my record of that. I should mention that there is more to my schedule than that - which I'll spell out specifically in a moment, but I'll mention here that we have Bible time together over breakfast before Alone Time, and then we have a time together after that for French and for songtime. This is done in a physical way - for instance, two days of our weekly French time are done 'physically' (Monday we do "French ball" - bouncing a beach ball back and forth while reviewing basic 'how are you/fine, thank you, and you' lines as well as counting in French; Tuesday we use Springboard to French, which has a kind of Simon Says in French approach, and has them walking around the room pointing to objects. For the record, we do Teddy Berlitz on Wednesdays, a read aloud of a familiar child's book in French on Thursdays, and watch on video or listen to a cassette tape a French song on Fridays.). And before we sit for our hymns, folk songs, and patriotic songs (not always all done on the same day - and we do generally listen to them right from the computer! ), we do an action/memory song, just to move around (Monday - song of Days of the week and Months of the year, along with a poem I read about 'thirty days hath September,' etc. ; Tuesday - song of Books of the Bible; Wednesday - song of names of the 12 Disciples; Thursday - song of 7 Days of Creation and the Greenleaf little poem about the 10 plagues; Friday - a song about the 10 commandments). So that provides a kind of transition from the close, straining, and sometimes intense work of handwriting, spelling, phonics/language arts, and beginning reading, to the expansive, imaginary brain process used in history and literature and poetry. Our Together Time is when I read aloud the selections found on the AO booklists. When I was only teaching my ds this material, I followed the weekly schedules more closely. Now, however, I do it a little differently. I made a list of the main books and material for year 1 and for year 3, on the revised AO schedules. I determined that my younger dd really did not interact enough with the year 1 material when my ds had it for me to skip it, so I included all of that (with one exception: we were already partway through Minn of the Mississippi for geography, so I determined my dd would be the listener for that book, not the narrator. My ds would narrate that, and when we were finished, we would then go to Paddle to the Sea, and he would listen, since he has heard it already, and she will narrate). For my ds, I made some changes, particularly in the area of history. Year 3 has the students reading more of Island Story. However, we had not read that at all before, and since Year 1 starts with it, we decided to start the book at the beginning. Year 3 has the students continue with This Country of Ours, from chapter 6 through 28. We had already read beyond that in TCOO, so we chose to halt that just for now. The same was true of Child's History of the World - I had already read aloud all of those chapters to my ds, so we set that aside for the time being. Trial and Triumph is begun in year 1 (with some intense chapters, I should note), and continued through year 3, so we determined to begin it together in chapter 1. And since Story of Mankind is for older students, we had no plan to use that. The additional stories for year 3, such as Da Vinci, Shakespeare, and Squanto, do not 'plug in' to where we are, so we are just reading the D'Aulaire books listed in year 1. At first, I couldn't figure out how to read all this material for Together Time, and not feel overwhelmed. But as I listed all the books, I began to see a pattern in it that would work for me. Monday's Together Time: LITERATURE: Pilgrim's Progress (we have finished the first book in this and are now reading the second - my ds loves this and narrates it quite well) SS- Geography: Minn of the Mississippi (we have decided to use the Beautiful Feet maps - this has been helpful, and our little tiny cut-out green legged turtle has now made it all the way down to the Gulf of Mexico! My ds has narrated this and after the last chapter, we'll switch to Paddle to the Sea during this time, and my dd will narrate) TALES: A child's book of Heroes by William Bennett (this is not on AO's list; however, we finished all the tall tales, and I wanted a worthy book of 'tales' - they are enjoying this very much. My ds narrates this one) SCI/NATURE: The Burgess Bird Book. We chose to read through this entire book, a chapter a week, and when we're done, we'll do the animal book. (We already read the little story books of Burgess at night). My dd narrates this. Tuesday's Together Time: LIT: Aesop's Fables - we are reading through the Winter's book of this. I believe I will have this be the first book my dd reads aloud herself before narrating. SS/HISTORY: Island Story. We print this off the internet and either read an entire chapter or half a chapter a week. Either of them can narrate this. TALES: Blue Fairy Book - we read all or a portion of a fairy tale, and my dd narrates this. SCI/NATURE: Parables from Nature. We select one and read half of it, if it's one of the longer ones. Wednesday's Together Time: LIT: Tales from Shakespeare. We take several weeks for a single play, and sometimes draw it out on a piece of poster board, to keep track. Either of them can narrate this. SS/HISTORY: a D'Aulaire book - currently we're doing Ben Franklin. TALES: Kingsley's "The Heroes" - a portion of a chapter per week. My ds narrates this (and loves this book, I might add!) SCI/NATURE: Story of Inventions - a portion of a chapter per week, narrated by my ds. Thursday's Together Time: LIT: Aesop's Fables, by Winter (I realize the Lit/Tales selections for this day could be reversed, but I have Aesop down for Lit for Tuesday, so I'm trying to be consistent! :-) SS/HISTORY: Trial and Triumph - a chapter a week (though we have split up longer chapters). They both narrate, sometimes through drawn narrations. TALES: Just So Stories - my dd narrates this. SCI/NATURE: Health (AO does not have a suggestion for health). We have read books on the body for this, and on blood, and now we are reading "Life Before Birth," a few pages a week. They can both narrate this. Friday's Together Time: LIT: Princess and the Goblin (my ds adores this book, and asks for it; he narrates it) SS/CURRENT EVENTS: AO does not have a current events requirement for lower grades, but I do ;-) We get two levels of God's World newspapers, and we read them on Fridays. TALES: Fifty Famous Tales - I am following the recommended order of these, as per AO. My dd narrates this. SCI/NATURE: James Herriott's Treasury - my dd narrates this. As you can see, the year the book falls in for the AO plan determines which child must narrate - year 1 selections for my dd, year 3 selections for my ds, and a few being possible for both or either of them. When we finish a book we will replace it with what would have been next in that category in that AO year. If there is not an equivalent, we will move on to the next year's choice, or plug in another book. At the end of each day's Together Time, if there are things that belong on the timeline, we put them there. Our timeline is a huge roll of butcher paper, marked off from creation through the present decade, and we marker in what we're learning in Bible, music and picture study, history, and so on. As I mentioned before, following Together Time, the younger kids get to play and I spend an Alone Time with my oldest dd. During lunch on Mondays, we have Nature study - we go through a topic for a couple of months (we finished reptiles; it's birds this time), and read up on it from the Handbook of Nature Study. When it's not frigid outside like it is now, we go for nature walks on Mondays after lunch. On Tuesdays, we have Physical Education - we leave for homeschool (support group) gymnastics, which we have all year. We do not do any other school that afternoon. On Thursdays, I try to have some cooking (my ds is allowed to make pancakes for breakfast on Thurs a.m.'s), and right after lunch, we have science (from the Science Lab in the Supermarket book), then our afternoon lessons, and then a handicraft or art time. I have to work harder on really planning ahead for this - because it's not just 'the next chapter' in a book. It (handicraft or art) often gets omitted, but I'm working on it! On Fridays, we have Picture Study over lunch. We are currently studying Copley, and will be doing Gilbert Stuart next. The Bible memory plan we use is from our children's Awana books. Our Awana program meets on Friday nights, and is run by a homeschooling family - and they are doing an excellent job, I have to add! Well, that is my schedule. I try to alternate intense math/writing type times with broader, imaginative type times. I don't finish by noon, as some families are able to (my day is usually over at 2:30 with them), but there are some breaks for them during the day. I try to associate certain things with certain days, and this gives structure to my kids ("It's Wednesday - that means we do Shakespeare, right?"). And I try to attach certain subjects to mealtimes, to make use of that time, and to make an association also. I hope this gives you some idea of how I fit in reading aloud to two children, in two different years in AO, while still supervising the education of a third. I hope it is helpful to someone! I do handwriting first. It seems that takes the most physical effort for him, so I want him to be 'fresh.' We are using Handwriting Without Tears http://www.hwtears.com and we can spend 5-10 minutes on this with him, and that is good for him. Next we do spelling. We are using Mary Pecci's material, so we are using her Super Speller for that (http://www.onlinereadingteacher.com ) - my ds is just beginning that, and he's happy to do it, but I didn't want him having to do some writing for that, and then be asked to do your 'best' writing in handwriting time. Again, we spend 5-10 minutes on this. Then we do the phonics from Mary Pecci's "At Last - A Reading Method for every child." (the above onlinereadingteacher website) We've seen remarkable growth in our ds with this method (growth in attitude, and growth in 'getting it') - which we attribute to a) the brilliance of Ms. Pecci's ideas, b) a coming together in him of several things so that 'this is the time', and c) God's answer to a great deal of prayer on our part. This phonics time includes the flashcard review and the new material. And the last 5-10 minutes (of course, a maximum is that this adds up to 40 minutes, and there are times when we go past the timer; other days, we are closer to the 30 minutes) is dedicated to his actual reading, from the Pathway Readers. What a joy to hear him progress in this! I know he will keep going and will soon catch up to his comprehension levels. I also use Mary Pecci's Super Seatwork books, and sometimes these are done during the off-half hour, when I'm working with his sister. (He's also allowed to use the computer at that time when he's done). I also start handwriting first, and we also do Handwriting Without Tears. We do the same thing, in terms of time - 5-10 minutes. We also then do spelling, using Mary Pecci's Super Speller. My dd picked up on writing and spelling very quickly, but I decided she's still young and it would be beneficial to go over some basics (though at a fairly quick pace - I'll do a spelling lesson a day, rather than a week, if she understands the principles behind it) to be sure there are no 'holes' in her foundation. We also have gone through some of Mary Pecci's principles, just because my dd picked up on so much of reading on her own (as a result of hearing me do Joyce Herzog's Scaredy Cat Reading System with her brother last year - that clicked with her, though for him it provided mainly a deeper understanding of the starting point, but he couldn't get much past it). I want to be sure that she has the tools for new words, since I notice that she sometimes halts on a few unfamiliar words. So we have reviewed the sight families and made sure she knows them. My dd and I end our time with her reading aloud from a couple of books - we have a "Meet Thomas Jefferson" book that intrigued her one time, and we 'buddy read' (I think I'm describing it correctly) that book. I read a sentence, and then she does, and so on. We read one page from that book each day. Then she reads all on her own from an early reader . She has read through "Clara and the Bookwagon," and she's now nearly done with a "Frog and Toad" book. As for seatwork for her, I expect that soon I will assign copywork to her, and she will do that as seatwork, and perhaps sometimes another type of assignment during her brother's Alone Time. There's something else important to consider. For both of my children, I consider narration to be an integral part of Language Arts. That is their composition, their reading comprehension, their creative writing, their sentence structure and their grammar understanding. My schedule would have us doing math definitely 3 afternoons a week, and possibly one more, too. I have written in the idea of having possibly some work in the evenings, but I haven't put that in place yet. I should remind you, not to say too much about my ds, that my ds is behind in his learning in the areas of math and reading. There is a reason I do the very short lessons with him, and that may or may not apply to someone else. I do think I have heard others say that sometimes (and this may not be the case with you) we focus more on finishing the math problems than we do seeing if our children understand the math. My oldest, 17, is taking Algebra 2 (Math-U-See) and will do their Trigonometry as well before she graduates - and I have a system with her in which after she learns the new material, if she does one page (of their 4 pages of assignments) perfectly, she can go on to the test. I don't see the need for her doing lots and lots of what she has demonstrated she knows, understands, and recalls. Others might be able to answer your questions better than I can, but I would slow down the pace if I were you. I think we tend to still think of AO's years as grades - and they are not. This material is intense, and of a high standard, and if a child is not grasping it, I would slow down the pace until I saw them 'catch up.' I might also try other ways of narration, though - using legos, drawn narrations, answering specific questions, acting it out, having them ask you questions on the material (Last year, I had several cards and my younger kids could draw one and that's how they would narrate, with whatever was written on that card). It may be that your ds' narrating skill needs strengthening, and you might want to 'linger' longer in material while he builds that 'muscle'.